I tried 2 varieties of this cereal: 1) Cinnamon Almond; and 2) Oats & Honey. Of the two, I narrowly preferred the Oats & Honey variety. In both products, the small granola clusters tend to settle toward the bottom of the box. I advise that you shake the box up a little before pouring a bowl. In these cereals, (I believe smaller-than usual) traditional Cheerios pieces are mixed with small, actually-crunchy granola clusters which add a new dimension to the Cheerios experience. In the Cinnamon Almond variety, the cinnamon has a big presence - any more and it would have been too much. The Oats & Honey variety tastes exactly like Honey Nut Cheerios. The granola clusters in that cereal make less of an impact. It's more of a sensation of "why do my Honey Nut Cheerios feel funny?" With that said, I liked both cereals very much. 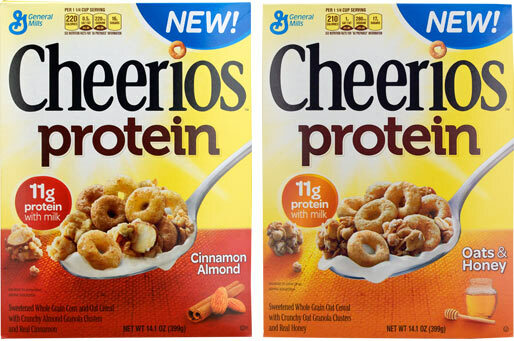 I liked the Cinnamon Almond version because it has a flavor you don't usually equate with Cheerios. I liked the Oats & Honey version because it reminded me of an old favorite. A 1 and 1/4 cup serving of Cinnamon Almond Cheerios Protein has 220 calories, 4.5 grams total fat (0.5 gram saturated and 0 grams Trans), 0mg cholesterol, 220mg sodium, 40 grams total carbs, 3 grams dietary fiber, 16 grams sugar and 7 grams protein. 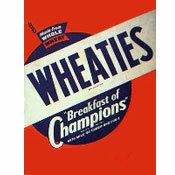 A 1 and 1/4 cup serving of Oats & Honey Cheerios Protein has 210 calories, 3 grams total fat (1 gram saturated and 0 grams Trans), 0mg cholesterol, 280mg sodium, 42 grams total carbs, 4 grams dietary fiber, 17 grams sugar and 7 grams protein. 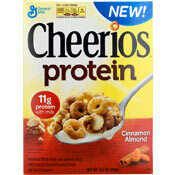 What do you think of Cheerios Protein? Getting harder to find in Alabama. Hopefully they will be back around soon, but these are a very important part of my daily meal plan. Love the Oats & Honey Cheerios, can't stand the cinnamon almond - waaaaaay too much cinnamon for my taste! But the oats and honey had chunks of granola that were very satisfying! This Cinnamon and Almond Cheerios are the best. They are the only ones I can eat and now I can't find them. What with that? Please tell me they haven't discontinued them. I don't know what I will do! I like them! I throw on a pinch of walnuts, sliced almonds or whatever I have on hand and a pinch of dried cranberries. Very tasty!